Alaska Ocean Acidification Network’s “Ask A Scientist” series: Can ocean acidification be stopped or slowed down? Brad Warren, the founder and director of Global Ocean Health, answers this question through the Alaska Ocean Acidification Network’s “Ask A Scientist” series. Alaska Ocean Acidification Network, 27 September 2018. Video. NOAA’s National Centers for Coastal Ocean Science (NCCOS) are pleased to announce a total of $4.37 million in funding for 16 new research awards in Fiscal Year 2018, with an additional $7.38 million for 30 continuing awards. The newly funded projects span the ecology and oceanography of harmful algal blooms (announced earlier this month), coastal hypoxia research, ocean acidification thresholds in coastal ecosystems, and coral ecosystem connectivity in the western Gulf of Mexico, and involve over 74 scientists at 39 institutions. All awards went through a rigorous competitive peer review process. Regions of research projects include the Great Lakes, New England, the Gulf of Mexico, coastal California, the Pacific Northwest, Chesapeake Bay, Alaska, and Florida. NCCOS is funding the latest scientific research to support environmental managers coping with increasing and recurring toxic algae and hypoxia, potential loss of coral reef habitat, and the threats of ocean acidification. Improved understanding of these timely coastal threats will lead to better predictions, mitigation, and possible solutions to support safe and healthy coastal communities and economies. Description: Ocean acidification is predicted to significantly impact coral reefs and the associated ecosystem services they provide to human societies. To inform, validate, and improve experiments and predictive modelling efforts, scientists from the National Oceanic and Atmospheric Administration (NOAA), the Intergovernmental Oceanographic Commission (IOC) SubCommission for the Western Pacific (WESTPAC), the Secretariat of the Pacific Regional Environmental Programme (SPREP), and many countries of the western and central Pacific Ocean have established an integrated, interdisciplinary observing network to assess spatial patterns and monitor long-term trends of the ecological impacts of ocean acidification on coral reef ecosystems. An updated version of the OA-ICC bibliographic database is available online. The database currently contains more than 5000 references and includes citations, abstracts and assigned keywords. Updates are made every three months. The database is available as a group on Mendeley. 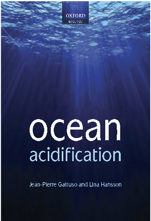 Subscribe online or, for a better user experience, download the Mendeley Desktop application and sync with the group Ocean Acidification (OA-ICC). Please see the “User instructions” for further details. Marine mussels (Mytilus trossulus) attach to a wide variety of surfaces underwater using a protein adhesive that is cured by the surrounding seawater environment. In this study, the influence of environmental post-processing on adhesion strength was investigated by aging adhesive plaques in a range of seawater pH conditions. Plaques took 8–12 days to achieve full strength at pH 8, nearly doubling in adhesion strength (+94%) and increasing the work required to dislodge (+59%). Holding plaques in low pH conditions prevented strengthening, causing the material to tear more frequently under tension. The timescale of strengthening is consistent with the conversion of DOPA to DOPA-quinone, a pH dependent process that promotes cross-linking between adhesive proteins. The precise arrangement of DOPA containing proteins away from the adhesive-substratum interface emphasizes the role that structural organization can have on function, an insight that could lead to the design of better synthetic adhesives and metal-coordinating hydrogels. 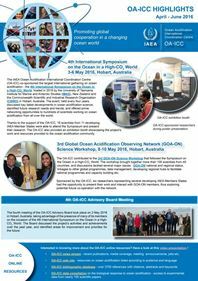 The new edition of the “OA-ICC Highlights” summarizes the project’s main activities and achievements over the period April – June 2018. The content is structured around the three major areas of work of the OA-ICC: science, capacity building and communication. Links to the project’s main resources are also provided.